flop (flahp) 1. verb. flopped, flopping, flops. To fall down intentionally after little or no contact with an opposing player in order to draw a foul. 2. noun. The act of flopping. 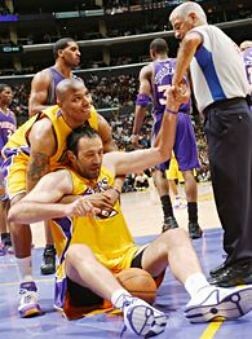 Usage example: Vlade Divac once flopped after brushing against Shaq's shoelace. Needless to say, he drew a flagrant foul. Word Trivia: The King of Flop. Sir Flops A Lot. Floppy Divac. The Serbian Flop Monster. These nicknames -- and more -- were all applied to Vlade Divac over the course of his illustrious 16-year career. 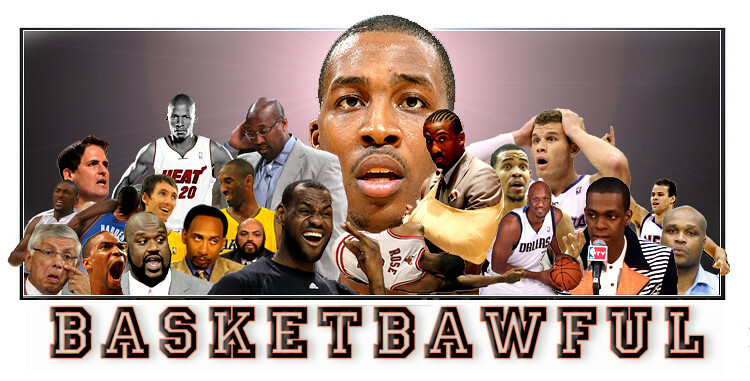 No one remembers the 14,000 points, the 9,000 rebounds, the 4,000 assists. They remember the fact that an opponent couldn't sneeze without sending Divac pinwheeling into the crowd or sprawling to the floor like he just got shot in the heart by a bazooka. Extra Word Fun: Go read The Art of the Flop over at ESPN.com. Vlade drew over 5,000 personal fouls during hiscareer, yet never actually got touched. Amazing. They leap. They soar. They dunk. Larry or Stephon? Is that even a question?